Panasonic has applied the prohibition of Analogue Video Output for AACS contents, e.g. BD-Video, to DMP-BDT500EG units which have been produced from November,2013 with the label (picture ) on the box and the message (picture ) on HOME menu is displayed, because of the reinforcement of the copy right protection. 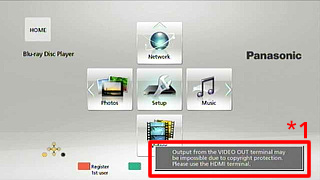 When playback Blu-ray disc, the Output from the VIDEO OUT terminal is disabled. 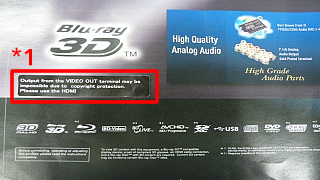 Blu-ray disc can be viewed through only HDMI cable. 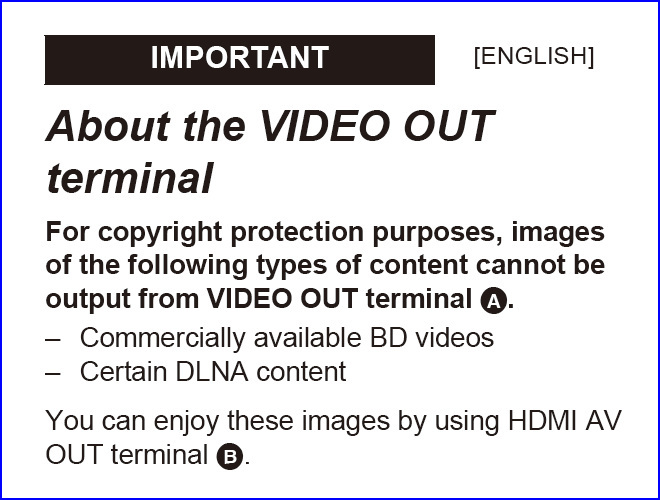 *1 Output from the VIDEO OUT terminal may be impossible due to copyright protection. Please use the HDMI terminal.